(road D18 and then road D3 on the left). Stay on D3 in the direction of CESTAYROLS. 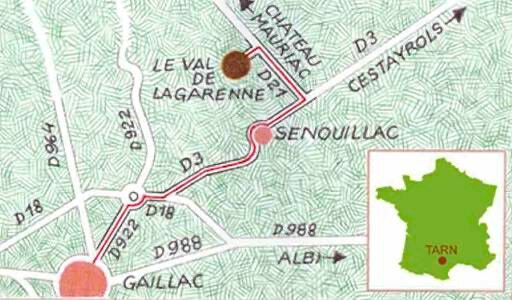 Once you have left SENOUILLAC behind you (circle it, but do not enter the village), turn left on road D21 towards Chateau de Mauriac. At the second fork, follow the road leading down on the left. Drive a bit further (about 600 meters) and Le Val de la Garenne is on the left.